Welcome to IGNOU MS-04 Solved Assignment 2015 download section of myignou.in. 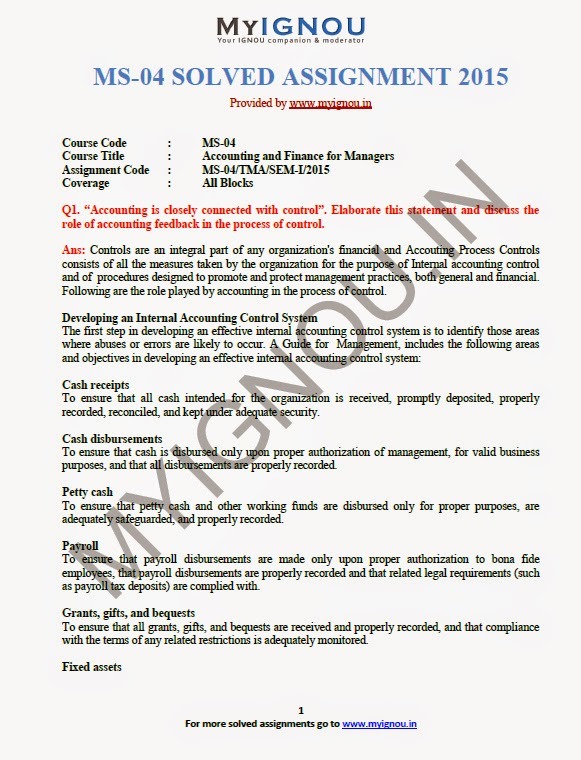 Here you will be able to download IGNOU MS-04 (Accounting and Finance for Managers) Solved Assignment for January 2015 session for free exclusively on this website. To get other solved assignments like our facebook page. Q1. “Accounting is closely connected with control”. Elaborate this statement and discuss the role of accounting feedback in the process of control. Ans: Controls are an integral part of any organization's financial and Accouting Process Controls consists of all the measures taken by the organization for the purpose of Internal accounting control and of procedures designed to promote and protect management practices, both general and financial. Following are the role played by accounting in the process of control. To ensure that all cash intended for the organization is received, promptly deposited, properly recorded, reconciled, and kept under adequate security. To ensure that cash is disbursed only upon proper authorization of management, for valid business purposes, and that all disbursements are properly recorded. To ensure that petty cash and other working funds are disbursed only for proper purposes, are adequately safeguarded, and properly recorded. Share "IGNOU MS-04 Solved Assignment 2015"
Share this page (IGNOU MS-04 Solved Assignment 2015) to let others know about it!